Love having this little baby in the cockpit. We’ve only been cruising for just over four months now, but it’s already been plenty of time to figure out what works and what doesn’t as far as all our electronics go. And that’s not even in a ‘broken or working’ sense, more of a ‘this was a good purchase/feature, or not’. Because if we knew then what we know now, we probably could have saved ourselves a lot of money on things we added that aren’t really that necessary. While talking to our friends Ron and Jackie who will hopefully be on our tails in just a few years, they asked what the best pieces of equipment to outfit their new boat with are, probably thinking they need a lot of the top of the line pieces we just purchased. Some things we’re definitely happy we got and will be recommending they do the same, but some things we got were just….unnecessary. So if we could help more than one person with outfitting their boat in preparation to go cruising, we happy to throw out some opinions and advice. But remember, this list is just meant to only be a piece of advice and our personal opinion. 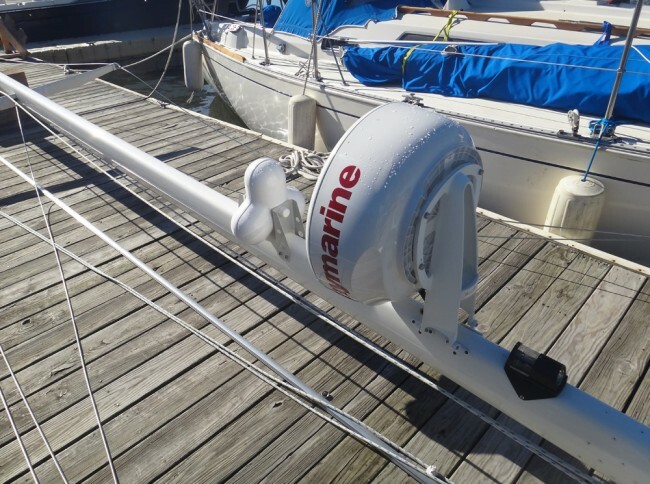 Every sailor is going to have a different idea of what works for them and it may not match with ours. This is a list of what we feel are the best purchased we made as far as electronics. 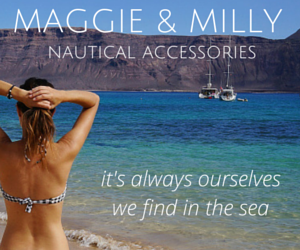 Things we couldn’t live without and we would definitely recommend to other boaters. Autopilot. Hands down this is the number one best purchase we could have added to our boat. Any time we’re out on the water it gets used. I could not imagine having to steer by hand for hours on end, it’s both physically and mentally tiring. With the set up we have now we only hand steer through narrow or winding areas like inlets, rivers, canals. Whenever we’re in a big body of water we just engage the autopilot and keep an eye on the horizon, and on the chartplotter, changing course by a few degrees or multiples of 10 when we need to. I don’t think we’d have the discipline to be on the water without it. I tip my hat to any of you that do. (Our autopilot is made up of Raymarine SX10 Computer; Raymarine rudder position sensor; Raymarine linear drive type 1; Raymarine st6002 head unit). AIS. Automatic Identification System. This favorable little device is a tracking system used on ships for identifying and locating vessels by electronically exchanging data. We only have the receiver part of this which means that we can pick up other ships transmitting, but not the transceiver which would allow them to pick up us. It’s still very useful for us though since who we need to keep the biggest eye out for on the water are the large containers/tugs/ect., that are traveling in the 10-20 knot range and are not likely to change their course to move around us. Meaning that on a bad night they could run us over before we ever saw them. But with AIS they send out a signal that we pick up on our chartplotter which shows their location, their speed, their direction, and usually their destination. We also have a way to set it up where our GPS reads their coordinates and speed against ours and will notify us if we’re on a collision course and can tell us when it will happen down to the minute. This takes so much pressure off on night watches or when you’re exiting the Charleston Channel at 5 am and you can’t tell if those bright lights are 1 mile away or 10. (Our AIS is Standard Horizon GX2100). These are the things that although we like them and have not had any issues with them, were not necessary purchases. Either there was a cheaper route we could have gone or a roundabout way we could have done it. But since they’re already on the boat…..happy to have them! Now that I’m finished I’m actually surprised by how many things are in the ‘need it’ category instead of the ‘it could have waited’. Sorry Ron, looks like you will have a lot of shopping to do for Hullabaloo. But again, what works for one boater may not work for another. There are tons of variables to take into consideration: type of boat; sailing destinations, personal preference; level of proactiveness (I’d say we fall somewhere in the middle there). But I think our best advice would be ‘You won’t know before you leave’. Meaning, it probably will take a few months of living on the boat, traveling, and finding out for yourself. So if you have the ability, leave with the bare minimum and stop along the way to pick up the things you find you need. Preferably while you’re still in the U.S., it would probably make it easier to get what you’re looking for and have all the necessary tools to get it installed. Busy day in New York Harbor. This entry was posted in If I Knew Then What I Know Now. Bookmark the permalink. Don’t toss out that handheld VHF yet. As you leave US waters and dinghy about and around islands it will become an Absolutely Essential piece of equipment. It’ll keep you in touch w home base when one of you leaves the boat and the other stays aboard, and it’s a bit of a safety net if you find yourself in straits in the dink or in a kayak. I kayak alone quite often, going miles away, and always take the handheld w me. As for those instruments, you need the depth sounder, the wind instruments, etc. Maybe you don’t need the extra display that you installed in the cockpit, although we’ve found redundancy to be a great addition to peace of mind. But you do need the instruments themselves or they couldn’t show up as displays on your chart plotter. As for the chart plotter itself, having the Raymarine chart plotter on the pedestal mount in the cockpit, using an IPad with navionics as back up, is, for our purposes, ideal. 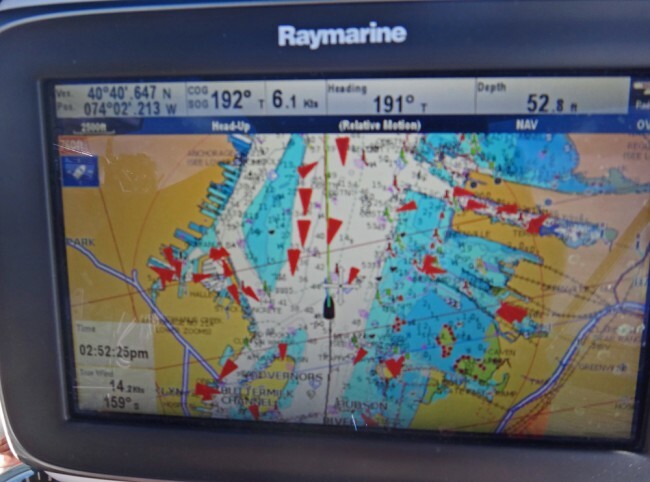 There are places where navionics charts are superior to those on the chart plotter. But again, redundancy is key. If you end up with battery failure or iPad failure and you don’t have a chart plotter you’re screwed. And the biggest thing is, you can’t turn down the back light on the iPad. For night sailing I turn the backlight on the chart plotter down to 8-10% and I still have night vision. 2 weeks ago we were doing an overnight along the coast, and while in the Hawk channel I decided to double check some marks on the iPad. I was night-blinded by the light from the iPad. It’s not a viable tool for nighttime navigation. As for the radar, once you’re offshore it’s essential again for seeing what’s around you in low visibility conditions. Not all vessels have AIS. Shrimpers, commercial fishing vessels, and a lot of private vessels don’t have AIS, and in dense rain, fog, and at night they’ll show up on radar. Bad squalls also show up on radar. I think once you leave inland and ICW waters you’ll develop a real appreciation for your radar. What we put on the boat that really increased our quality of life: solar panels. 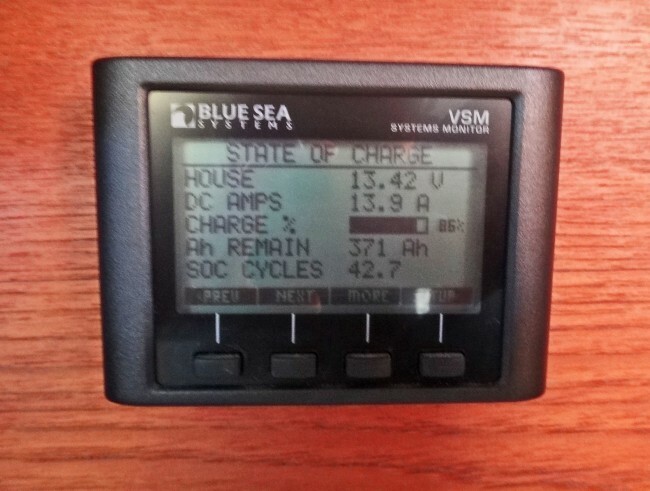 Takes care of most of our energy needs for an entire week away from a dock, so that we only need to run a generator once a week to top off the battery bank, keep the glass batteries in top working order. Hope you’re back on the water soon. Marjorie, Thanks for the insight on some of the electronics listed above. As I said, we’ve only been out for four months so it still isn’t long enough to know what we’ll need for the entire trip, just a list of what we’ve come to value so far. I’ve never thought of taking the handheld off the boat for use to get back to Serendipity or other boats if necessary, thanks for idea. And the instruments are essential, I agree, I guess it was meant to say they don’t need to be top of the line if the information is transferring to another place that you’re monitoring, I’ll make sure to go back and make that edit. On the chartplotter, we love ours. I love where it’s mounted and I love the adjustable back light as well. All the information we have on the iPad is it’s possibilities and reviews from other people we know who use them. They’ve done many overnight passages as well and have no bad things to say about it. They do also have paper charts as backups should anything happen to it, but any time you’re dealing with any kind of electronics there is the possibility of them going down and anyone on the water should be prepared with some kind of backup. We do appreciate our radar, but as I mentioned, it’s just not getting as much use at the moment as we thought it would. We’ve used it to watch squalls come in, use for markers, inlets, overlaying on our charts, but we’ve also been lucky in the states to have areas well marked and boats that use their navigation lights at night. Again, once we’re out of the country I’m sure it will be running all the time to double check the information on our charts or for use during night watches. We do have three solar panels, two 135’s and a 210, and you’re right, they should be in the post too. I’ll have to add those in as well. We don’t even use shore power since we run all solar and just use the engines to top off if necessary. They’ve been great to have and are probably in the top three things we’ve added to the boat. The real lesson I was trying to impart here was that you’re not going to know what you need 100% until you’re out on the water full time and learning what you personally need instead of what everyone tells you that you need while you’re still on shore. Thanks for the information and well wishes, we’re hoping to be back on the water soon too!